I haven't posted in a while because I have been all over the place and people have been in from out of town. Namely Roxy and Mabel! what a treat! Anyways here is my on the go travel kit. I am taking this with me to Costa Rica and it will be my mini entertainment center along with photocopies of my favorite cross stitch patterns and 2 good books. 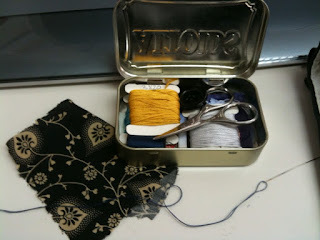 It is just an up cycled Altoids container I found in the trash at work. it fits embroidery scissors in perfectly. It also doubles as a mini first aid kit with matches, needles and band aids. I suggest you make one (or ask me to make you one) for your next trip! See you in a week! Sold sock monkey goes on sailing adventure!